A total of 314 papers on endoscopic ultrasonography (EUS) were published between July 1 2005 and July 31 2006. These articles were retrieved from Pubmed using the search terms endoscopic ultrasonography or endoscopic ultrasound or endosonography or EUS or echoendoscopy. As a marker of high quality of the research in this field, it is worth noting that as many as 168 of these (53.8 %) were original articles, equally divided between prospective (85 papers) and retrospective studies (83 papers). This proportion represents a notable increase compared with that found in previous analyses of the EUS literature  . Moreover, 7/168 original articles were multicenter trials (four prospective and three retrospective). Other publications included 76 case reports, 42 reviews, 20 editorials, and 6 letters. Tissue acquisition by EUS-guided fine-needle aspiration (FNA) has become an integral part of the procedure, as shown by the high number of publications in which this was addressed (92 papers among the original articles and case reports). In addition, therapeutic EUS is no longer merely experimental as shown by the high number of publications (28 papers) dealing with this topic, 15 of which were prospective original articles. 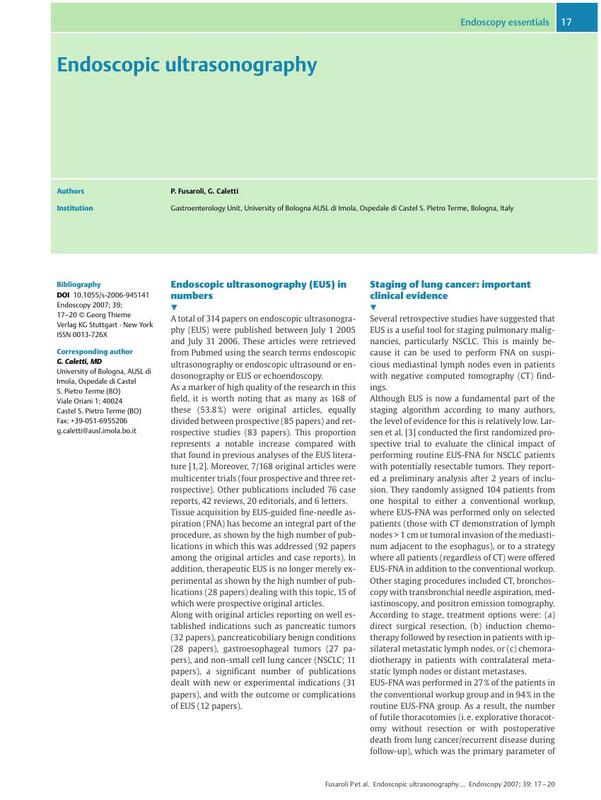 Along with original articles reporting on well established indications such as pancreatic tumors (32 papers), pancreaticobiliary benign conditions (28 papers), gastroesophageal tumors (27 papers), and non-small cell lung cancer (NSCLC; 11 papers), a significant number of publications dealt with new or experimental indications (31 papers), and with the outcome or complications of EUS (12 papers).